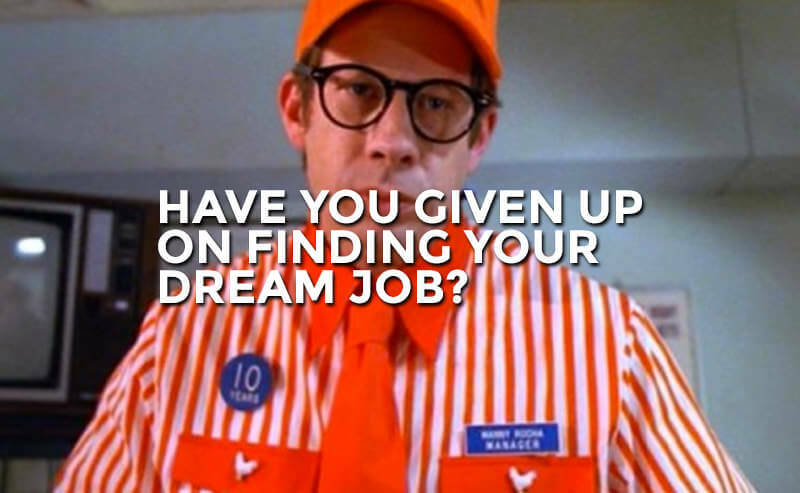 Blog Have You Given Up On Finding Your Dream Job? Frederick Buechner wrote that “Vocation is the place where our deep gladness meets the world’s deep need.” If vocation is defined as a person’s employment or occupation, then Buechner seems to be saying that the job for us is the one that makes us very glad while meeting the deep needs of others. Having such a job would be a lovely thing. Indeed, it would be the epitome of dream job—not only does it make you happy, but it makes others happy too. If you can get a job like that, take it. If you have the opportunity to pursue the education needed for a job like that, do it. If you have the financial freedom (no kids, no mortgage, etc.) to put in the hard work as an aspiring musician, artist, writer, photographer, or whatever it might be, then do just that. But if there is one thing I’ve learned from traversing the sobering decade called my “20’s”, it’s that one by one all of my aspiring artist/musician/writer friends have slowly become my hard working banker/insurance/construction friends. Maybe not all of them. There are a few still pursuing the dream. There are a few that actually made it, making a real living doing what they love. But many now have normal vocations—doing things that don’t make them deeply glad and don’t meet the world’s deep needs. And I think that is just fine. Really. I think having a normal job doing normal things is just fine. There is far more to life than the arts, and much greater value in being faithful to your wife than in being artsy. There is much greater satisfaction in having true relationships than there is in writing a true song that makes you real money. Feeding your family is more important than feeding the poor, and much more important than starting a non-profit that gets shoes to poor kids. This is not to denigrate the arts or music or philanthropy—they are all very good things. But life offers us much that is just as valuable and often far more valuable. Yet we are all too willing to sacrifice these things for the sake of our dream jobs. We are also far too unhappy given all the things we do have. Not having your dream job doesn’t mean that you’ve missed the boat on satisfaction in life. The Bible says that God has given us all gifts and it implies that he has given us all passions (perhaps it actually says it somewhere), but it was the self-esteem movement—not the Bible—that told us we are all entitled to a job that stimulates all our passions and makes use of all our gifts. And who knows who told us that we must have that job in order to be happy—Oprah? Rob Bell? I have other people I dislike to put on the list, but the point is that whoever said it was terribly mistaken. He or she was terribly damaging to our happiness too. Let us forsake our misguided discontent. We don’t need dream jobs to be happy. God’s will for your life may be for you to be a garbage man. But know this: whether you are a garbage man, fashion designer, or professional athlete, you have all the contentment and joy in the world at your fingertips. It’s in the people around you and the God who made you. Returning to the almost certainly well-intentioned Beuchner: I would add that meeting the world’s deep need ought to bring us much gladness—so much so that the jobs (vocations) we don’t particularly like should be made likable in virtue of the fact that they are meeting the needs of others. It wasn’t my idea, but it is profound. Consider your job to be practice loving your neighbor. And consider this: if you really feel that way about your job, then the more you love your neighbor, the more satisfying your job will be. Even if all you do is work out your neighbor’s health insurance problems, if you really love him or her, you will find great pleasure in solving that annoying insurance problem. You will find great pleasure in delivering that copy machine part. You will find great pleasure in writing that report. Instead of pursuing a job we love, maybe we ought to pursue a heart of love for the people around us. Then we can have both.